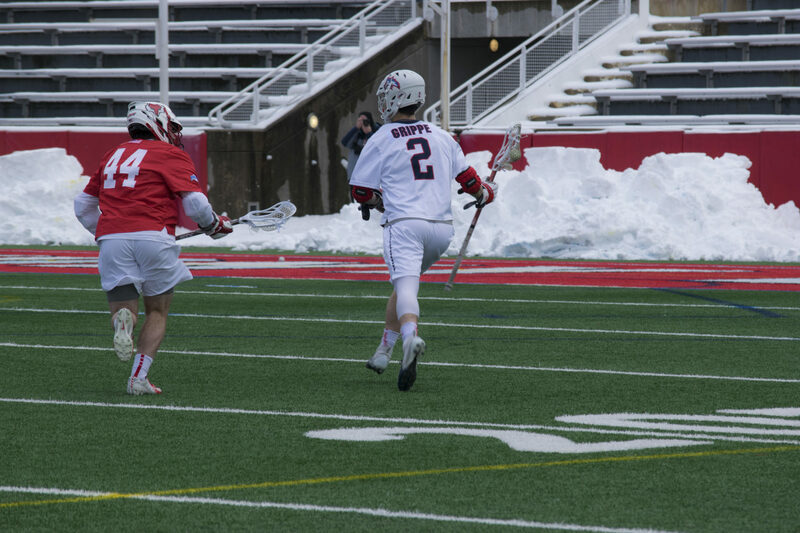 In what was a thrilling game from start to finish, Stony Brook Men’s Lacrosse bested the St. John’s University Red Storm at DaSilva Memorial Field in Queens, NY by a score of 12-11 on April 2. The victory capped off a career performance from junior goalkeeper Michael Bollinger, who totaled his career-best 18 saves to keep the Seawolves ahead of the Storm to seal the victory. The Seawolves initially trailed 5-3 after the first quarter deficit and then 7-6 at halftime. Red Storm sophomore attacker Joe Madsen led the team’s offensive push by scoring four goals in the matchup. The Seawolves exploded out of the half, outscoring the Storm 6-3 in the last two quarters./midfielder Chris Pickel Jr.’s third hat-trick of the season as well as a two-goal game from senior midfielder Owen Daly, and junior attacker Connor Grippe. Goals were also scored by sophomore midfielder Patrick Kaschalk, senior long stick middies Ryland Rees and Justin Pugal, sophomore attacker Jack Walsh and junior attacker Cory VanGinhoven. The Seawolves managed to dominate in other aspects of the game too. The team won 33 ground balls to the Red Storms’ 26, the Seawolves cleared the ball better and, most importantly, Bollinger out-performed St. Johns’ freshman goalie Brody Agres 18-14 to keep the Seawolves ahead of the Red Storm. With this win, the Seawolves improve to 6-4 on the season. They also sit at 2-1 in America East conference play with a majority of their games for the rest of the season coming in-conference. St. John’s, meanwhile, drops to 4-6 for the season. The Seawolves will return home on Saturday, April 6 to face the Princeton University Tigers at Kenneth P. Lavalle Stadium at 7 p.m. for their final non-conference game of the season.